Highland County Health Commissioner Jared Warner told The Times-Gazette that although he sees benefits for legalizing medical marijuana, other issues like potential teen abuse, accidental child poisoning and legal complications in the workplace concern him. As a medical marijuana dispensary awaits a permit in Hillsboro, the local health commissioner says that while he believes medical marijuana is beneficial in some cases, he has lingering concerns about its long-term implications. 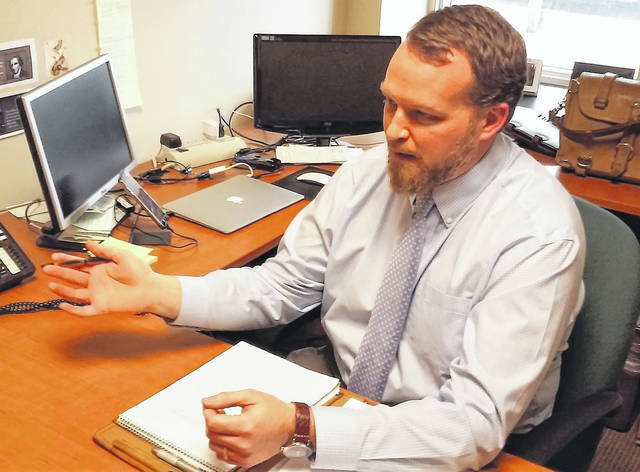 Highland County Health Commissioner Jared Warner said he personally knows people suffering with chronic disease and ongoing pain issues who could benefit from medical marijuana, but he also knows of situations that could lead to potential abuse. According to Warner, local physicians are now certified to write prescriptions once a storefront location opens, but he would not disclose names. As previously reported, a company called Debbie’s Dispensary Ohio 4, LLC, registered at 1088 N. High St. in Hillsboro, won approval last June for a provisional license to dispense medical marijuana, but Warner said the business has not yet been issued a permit. Debbie’s Dispensary has several dispensary locations in Arizona. When The Times-Gazette contacted its headquarters, calls were not returned. Warner said his office is looking at a vast database of information from other states involved in the medical marijuana discussion — Colorado in particular — to get an idea of the impact that it will have from the standpoint of medical legitimacy and eventually into full legalization. “We really need to watch and see what kind of an impact this is going to have on the health of the public,” Warner said. With almost a decade of data from Colorado alone, he said there are a few issues that Ohio officials should be expecting when it becomes legal for medical use. Ohio’s medical marijuana law was passed in 2016 and signed by Gov. John Kasich, and Warner said the law is very specific in that patients using it must meet one of 21 qualifying conditions, including cancer or chronic pain. He said marijuana can be dispensed in the form of edibles, oils, tinctures, patches and vapor, and that patients and their caregivers will be allowed to possess up to a 90-day supply, but growing the plants at home or smoking it will remain illegal under the Ohio Revised Code. He cited evidence from Colorado that showed some patients using edible marijuana, not experiencing as fast of a reaction as they expected, and ingesting more. Eventually, patients consumed several days’ dosage and had to be rushed to the hospital with overdose symptoms. Another concern he has with edible marijuana is its appearance, which sometimes resembles candy. Due to that appeal, several cases of accidental child poisoning have come from the Colorado data, much like the poisoning cases of children mistaking laundry detergent pods for candy. There is also the potential of an increase in auto accidents for those who operate motor vehicles while using medical marijuana, which he described as a “tricky subject” since test kits are effective over a 30-day period and will reveal the drug’s presence, but not whether a person was under its influence. Still another worry is in the workplace, where an employee who is lawfully using medical marijuana may be confronted with a corporation’s drug-free policy during a random drug test. He said that as the issue moves forward, both public health and law enforcement officials need a good baseline of data to gauge how legalizing marijuana for medical and potential future recreational use will impact both the short- and long-term. For more thoughts from Warner on the medical marijuana issue, see his guest column here.